I encourage you to get lost. 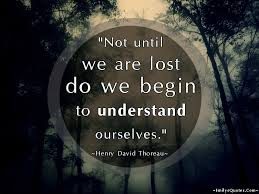 What would you say if I told you that one of the keys to increasing your EQ (Emotional Intelligence) is to get lost? Kind of a crazy thought, right? I’m not talking about being air lifted into the middle of the Amazon Rainforest and searching for a way out. That actually may hinder your emotional intelligence. The lost I’m referring to is the ability to get lost in all of the things you don’t know you don’t know. Are you confused yet? Don’t worry, it will all make sense. In order for any knowledge (or skill) to appear in the first column, we must go through four critical stages of learning. With regard to emotional intelligence, this journey requires us to look inward so that we may ultimately uncover self-knowledge. What I failed to realize is that it wasn’t my personality that was preventing me from achieving happiness; it was my lack of self-awareness. It was a “blind spot” in my life. Just as we have blind spots when we are driving our cars, they are also present as we drive our lives. We just have to look for them. This is the lost stage of the journey. While you might think of being lost as a bad thing, with regard to emotional intelligence, it’s actually the beginning of great things to come. I can remember taking a personal development class with my wife almost ten years ago and feeling really confronted by the information I was hearing. As a teacher, I had prided myself on all of the knowledge I possessed and was able to share with my students (see column 1 above). However, what I was clearly lacking was self-knowledge, which is precisely what they were uncovering in this class. As the presenters continued to introduce ideas that were brand new to me (i.e. the power of subconscious thinking), I shifted from a feeling of overwhelm to a feeling of peace as I realized that my blind spots were now in full view. This is the stage where a lot of people tend to give up. They revert back to old ways of being because the amount of effort and focus required to develop this skill is just too much. Think about the hours of practice that professional athletes log throughout their athletic journey. While they may possess a certain God-given skill, practice allows them to hone the skill so that they do it automatically in a game situation. The same is true in the game of life. The first three stages are what I call the skill-building phase, where we learn to use the tools. In Stage 4, the tools begin to use us. It’s similar to a habit in that once we do something (or think something) a certain number of times, it operates on auto-pilot or cruise control. The focus and effort that are critical in Stage 3, end up paying off in Stage 4 as it literally becomes a part of who we are. If you are curious about emotional intelligence and would like to uncover some of your blind spots, I have a wonderful opportunity for you. On Wednesday, March 18 at 4:00 pm (PST), I will be hosting a webinar as part of Vitality: 4th Annual EQ Conference. In it, I will share several of the core competencies that make up EQ and how you can use them to move through the above stages of learning. Click here to register for this FREE webinar.